NOTES: Heavy brass template and clear plastic pegs. Well, now you can simply make your own. While most of these lights are clear, there are cases where they are colored. 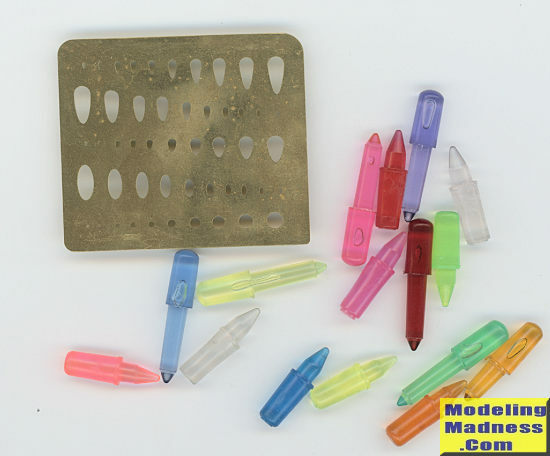 PM has provided a variety of colored a clear plastic pegs to use with this. 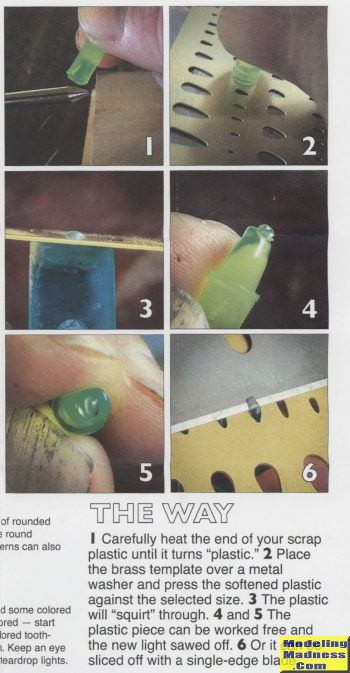 You can also use the clear sprue from your kits. This is actually quite easy to use, but you do have to have some basic items. One is a heat source and it is recommended not to use a flame as it gets too hot. The very nicely done instructions have a lot of photos and I've taken the liberty of copying the 'how to' so you can see how it is done. In this case, a pencil soldering iron is used as the heat source. These are inexpensive to buy, come with a stand so you don't have to hold it, and get plenty hot, even at 25 watts. You also need something on the other side of the hole so not to smush the light and a thick washer is recommended. The operating steps are pretty easy to read on the scanned image so I'll let that suffice. Well worth picking up as the tool is good for more than simply a template, but I'll let you get one and read the instructions to see other uses. Thanks to Pacific Monograph for the review set. You can get yours today fromthis link.